Although Russell Clark was a strapping 6-foot, 2 ½-inches tall, 210 pounds and physically fit, the Marines wouldn’t have him; neither would the Navy or the Coast Guard. The reason: the 21-year-old was married with a child on the way. He got the news from recruiters the Monday after the Japanese bombed Pearl Harbor and destroyed most of the U.S. Pacific Fleet. It took him weeks to convince the Coast Guard to let him go to sea as a cook. When he got aboard his first cutter he spent the next 39 months chasing German subs and enemy weather crews, served on convoy duty and delivered goods to military outposts in Greenland while sailing the turbulent waters of the North Atlantic. “I ended up aboard a 100-foot trawler owned by an Icelander named Capt. 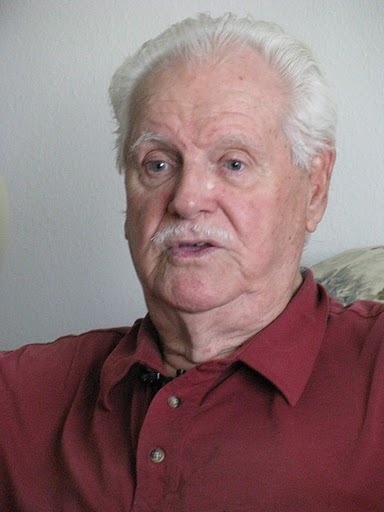 Magnus Magenuson who was brilliant and had a rating allowing him to sail ships of any size on the seven oceans of the world,” the 91-year-old resident of Presbyterian Villas in Port Charlotte, Fla. said. “His trawler, Nanook, was the biggest in Boston Harbor converted to a cutter —WPY-169. “He was a hell of a skipper, but he wasn’t much on rules. Aboard ship we dressed in all kinds of clothes—Army clothes, Coast Guard clothes, Army shoes. We had no rules or regulations,” he said. 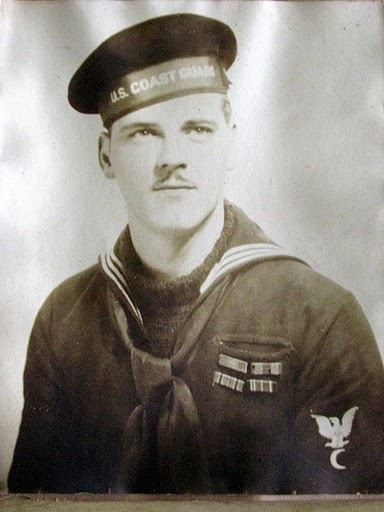 Clark is turning out his specialty aboard the Cutter Stories, his second ship, while serving in World War II. To make matter more interesting, Clark did not go to boot camp. Three days after he joined the Coast Guard he went aboard the cutter as the chief cook. 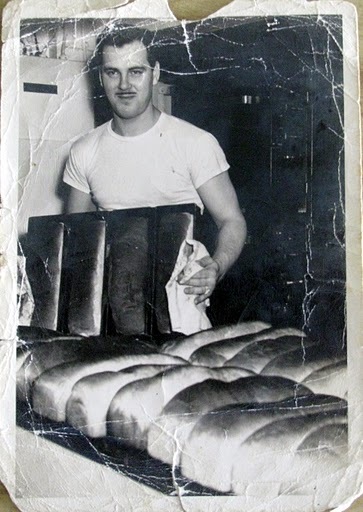 He had spent the first 10 years of his working life as a baker and cook on shore. He was affectionately known as “Cookie” aboard the cutter. The Nanook’s main armament was a 3-inch gun on the bow. She was also armed with a couple of 20-millimeter antiaircraft guns and a .50-caliber machine gun mounted up high in the rigging. After 22 months at sea the Nanook returned to Boston and Clark got off. Three days later he was back aboard his second cutter—USCG Stories, Cutter-38, a 245-foot-long converted buoy tender. It had a much larger crew and with better armament. “It was aboard the Cutter Stories we caught up to the German freighter and submarine off the coast of Greenland. The Germans wanted to establish a weather station up there so they could forecast the future weather over England,” Clark explained. “With a station in Greenland they could predict what the whether in England would be six to eight hours in advance. It would allow the Luftwaffe to bomb England just before the approach of a storm. “Our spotter plan found the German freighter near the coast. Two cutters, ourselves and another, converged on it. It was accompanied by a German sub that fired a couple of torpedoes at us,” he said. “The ice in the sea was so deep they hit an iceberg near the other cutter and the concussion from the blast damaged its engine and steering mechanism of the cutter. Our ship wasn’t harmed. 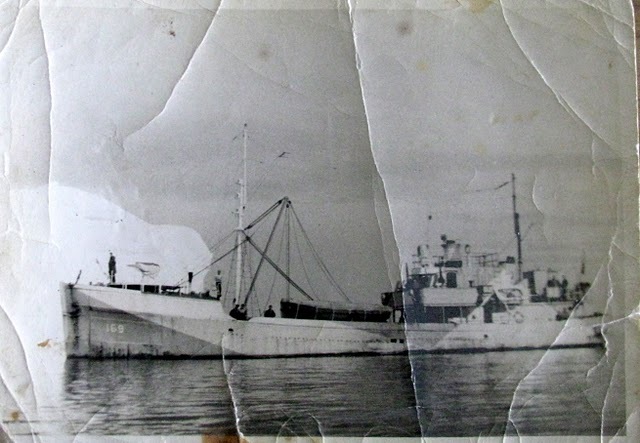 This 100-foot Boston trawler was converted to a Coast Guard Cutter. She was rechristened WPY-169. Russell Clark was the chief cook aboard ship. Photo provided. “Our two cutters fought a running sea battle between the freighter and the submarines until the sailors aboard the German surface vessel abandoned ship, blew it up and took to rubber life bats,” Clark said. “We captured all 50 of them in their rubber boats and split the POWs up between the two cutters. We took them to the brig back on shore. The sub escaped the battle apparently unscathed,” he said. They towed their damaged sister ship back to Greenland for repairs. The Germans were never able to establish a weather station on Greenland in Stories’ jurisdiction. Before the incident was over the Cutter Stories and its crew had taken the crew of the German trawler prisoner without much of a fight. Life aboard the Stories was much easier than it had been aboard his first cutter, Clark explained. It was better because he had more space and a minuscule staff that worked with him in the galley on the larger ship. Tragedy struck nearby on one of Clark’s voyages back to Boston after months at sea. It was December 1942 in the North Atlantic and there was a lot of wind, swells and ice aboard both the Cutter Stories and the Cutter Natsek sailing together back to Boston. “We were going through the Niagara Straights, connecting Canada and Newfoundland,” he said. “Our ship was coated with ice. My buddy and I were out on deck, with lines around us tied to the ship to keep us from falling over, chopping ice. “There were 28 aboard the cutter, and they were all lost. I knew ‘em all,” he said with a pained expression 68 years later. “The Coast Guard is a great outfit. It’s been all over the world in every war this country has ever fought. It just hasn’t gotten the publicity it deserves. They’re the police of the sea,” he said with pride. When the shooting was all over 1st Class Cook Russell Clark traded his uniform for a chef’s hat. For 74 years he’s worked in some of the best restaurants in the country including: Boca Grand Inn and The Temptation on Gasparilla Island and Hotel Punta Gorda before it burned in the 1950s, among others. He and his wife, Mert, moved into the Presbyterian Villas after Hurricane Charley decimated this area in August 2004. She died in April 2006. He has seven children from a previous marriage. This story was first printed in the Charlotte Sun newspaper, Port Charlotte, Florida on Monday, July 26, 2010 and is republished with permission.